Google Stadia is the company’s entirely cloud-based game platform. Announced today at the Game Developers Conference 2019, it’s focused on creating a centralized experience for both gamers, creators and developers. For example, after you’ve watched a gameplay video on YouTube, you’ll get the chance to play that game in just five seconds via streaming. That’s regardless of the platform you are using, be it a laptop, desktop, television, phone or tablet. The magic happens in the cloud, of course, with Google leveraging its considerable network of data centers to be able to maintain low latency regardless of where the player is located in the world. 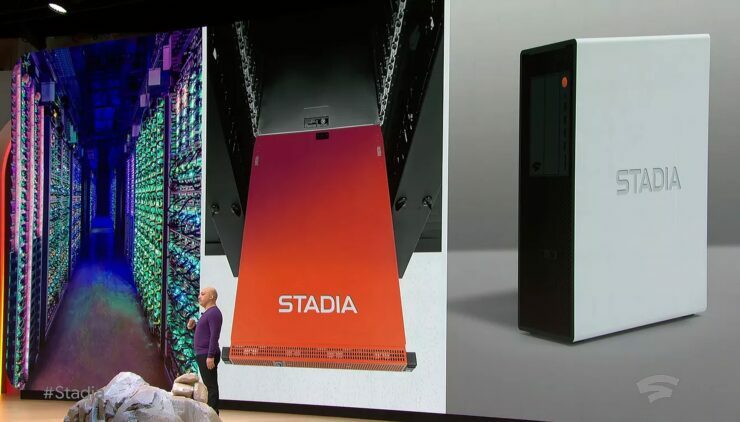 The hardware datacenters used for Google Stadia is powered by AMD technology and custom built for this use case. It surpasses the likes of PlayStation 4 Pro and Xbox One X put together with its 10.7 teraflops of computing power, 56 compute units and HBM2 memory. The CPU is a custom x86 processor clocked at 2.7 GHz which also supports hyperthreading and AVX2. Memory totals 16GB, with up to 484 GB/s of transfer speed, and 9.5 MB of L2 + L3 cache. While the Project Stream test showcased Assassin’s Creed Odyssey streamed at 1080p and 60fps, Stadia will be able to stream up to 4K HDR and 60fps gameplay with surround sound. The hardware will also be upgraded further over time to allow up to 8K and 120 frames per second later on. The games will run on Linux through the Vulkan API and Google already partnered with Unreal and Unity to add support for the Stadia platform to the most popular game development engines. While there won’t be any console for the game user, Google did introduce the Stadia Controller during the presentation. The gamepad has the same symmetrical analog sticks PlayStation gamers know already with the Dual Shock controller; in addition to that, there are two buttons specifically dedicated to enhancing the Stadia experience. Keeping up with the latest trends, full cross-platform play and save progression were both confirmed during the presentation. With regards to online play, Google is promising a ‘predictable’ multiplayer experience with fully synchronized player states. They’ve also hinted at the possibility to leverage the power of the cloud to enable higher fidelity physics, something we’ve heard before from Microsoft. Of course, games will be crucial as with any platform. That’s why Google brought on stage id Software, which confirmed DOOM Eternal for Stadia, while Dylan Cuthbert from Q-Games talked about the so-called State Share feature. This will let you save a state in a game, for example your specific position in a level, your health and items, for it to be shared with any other player if you want to as if you were only sharing a YouTube video. Cuthbert said State Share prompted an entirely new game concept at Q-Games, though the game itself will be unveiled at another time. Lastly, Jade Raymond will head up the first-party efforts. Stadia will launch later this year in the US, Canada, UK and most of Europe. Executive Phil Harrison said to expect more information at some point in the Summer.